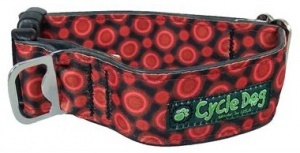 The Fatty Collar has an extra wide width of 3.8cm (1.6 inch) and is great for dogs with long necks or large dogs. 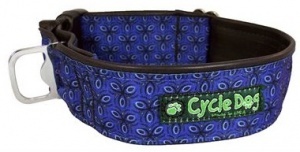 Cycle Dog Collars are made from recycled bicycle inner tubes and printed polyester webbing. The material is soft and therefore very comfortable for dogs to wear. They feature a strong quality plastic buckle and the Pup Top Bottle Opener that also acts as a lead attachment rather than a standard D ring. All Cycle Dog Collars are mould and stink resistant too, so ideal for those who love to roll!